Whether you have flat thin hair or hair full of body, the Monroe Teasing U Brush is perfect for adding the right amount of volume and bounce to a styled up-do or just at the root to effortlessly fall nicely at your shoulders. The problem with most teasing brushes is the bristles tend to cause a ton of knots causing discomfort when finally brushing out the hair. 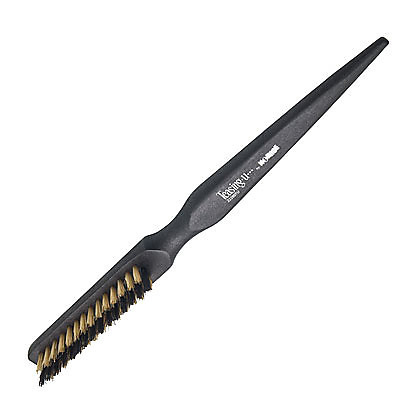 This brush has 100% boar bristles which allows for an easy comb through minimizing breakage and split ends! Not only can you add volume, this nifty design is great for smooth and sleek backcombing! Get that desired finish you only see from salon up-dos easily. Here are a few styling tips below to help you achieve salon professional looks! * For maximum teasing results spray the crown of your head with dry shampoo. The added texture helps keep hair in place before a light spray of hairspray to finish the job. Our go to product is Pronto Dry Shampoo Spray by Oscar Blandi (only $21.00 at oscarblandi.com). * Tease in sections! This will minimize knots and help get double the volume. * Use a shine spray for a sleek finish when backcombing. This will drastically reduce flyaways! We really like Hemp Shine Spray by Alterna (only $20.00 at Ulta Beauty). * I know we probably said this a million times but we are going to say it again. FRIZZ is caused when hair is moist and you then go outside into a moist climate. Thoroughly blow out all your hair before doing any styling during these hot months.